An absolutely traditional Third Doctor story establishes Tim Treloar’s recasting as Three. It’s not particularly remarkable, apart from the fact that it could so very easily be just another season 8-9 serial, right down to the incidental music. 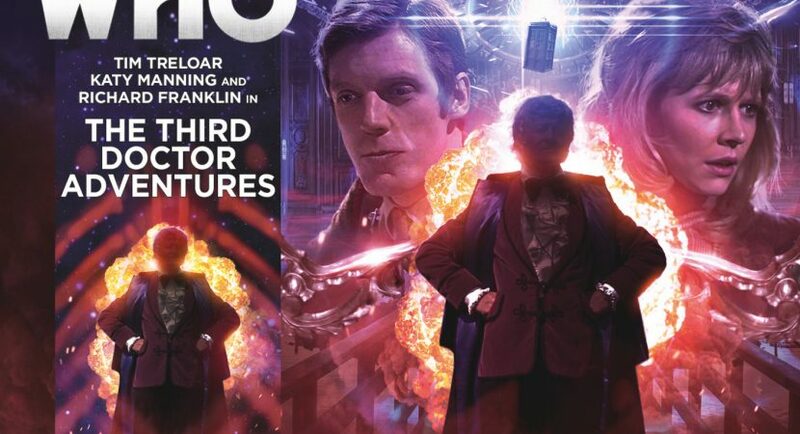 Justin Richards is a seasoned hand, and it sounds like his brief was to demonstrate that Big Finish could recast Pertwee and still pull off a completely authentic Third Doctor story before they start playing around. Have a trailer (for both stories in the two-adventure set). This is a 4-parter, rather than one of Pertwee’s 6-7 ep marathons. It starts out slow— this is like Season 8 minus Delgado— with Captain Yates investigating a minor mystery at a local archaeological dig. The Doctor, as usual, has to be chivvied out of his lab by Jo. Once they finally arrive on scene, they head down under the lake, where divers have discovered an ancient airtight structure where one has no business being there. Three guesses what it is, and the first two don’t count. Sure enough, they rouse the threat that’s been dormant down there for centuries. Jo, the Doctor, and friends are soon dodging monsters, running for their lives, and trying not to run out of oxygen. Being underwater with no quick route back to the surface adds to the sense of looming danger. This is another story whose plot I could guess in broad outline right from the title. It’s exciting, for the most part, although it relies an awful lot on “this diving suit/door/control mechanism isn’t working right now so we can’t proceed until it’s fixed” to ramp up the tension. Which is, of course, true of many classic Who stories. Director: I shall be in my office if anyone needs me. Doctor: Rest assured, Director, no one needs you. Good day. I haven’t caught up on his Companion Chronicles, so this is my first outing with Richard Franklin since his cameo in The Five Doctors. He’s still Mike? Reliable (at least for now), a bit more tactical and circumspect than stodgy, frank-speaking Benton. His voice has shifted like they all have, but I’m sure I’ll get used to it the way I have William Russell, Peter Davison and the rest. Katy is her usual sweet self, dialing it back a little to give Tim Treloar plenty of chances to shine, but every now and then Jo’s fierce love for the Doctor bursts out again. Gosh, that archaeological dig must’ve been rolling in cash. Even if we accept that the UNIT years were in the 80s and not the 70s, I didn’t realise that two-way wireless communications was possible in diving gear that far back, let alone that you could share a mouthpiece to save a drowning diver with that kind of equipment. And that CAV-suit seems awfully advanced for the era as well. These folks may not have much money to pay divers, but they’ve got the funds for state-of-the-art military hardware. But of course, classic Who often had contemporary scientists tinkering with tech that was purely in the realm of SF.